Both PlayStation VR Preorder bundles available now as many fans have voiced their concerns. It seems quite many of VR enthusiast already own a PS4 camera and/or PS Move controllers. This is very much understandable due to the last generations entry to 1:1 motion controller and now the widely popular PS4 camera. Today on March 22nd you will be able to preorder the PlayStation VR Launch bundle starting at 7 a.m. PT. Preorders are taking place at selected retailers such as Amazon and Gamestop. Although the launch window opens at 7 a.m. PT, we recommend attending said retailers early. PlayStation VR bundles sold out fast already in Europe. PSVR is projected to sell out even faster in America. Let’s have one more quick recap of these two bundles. 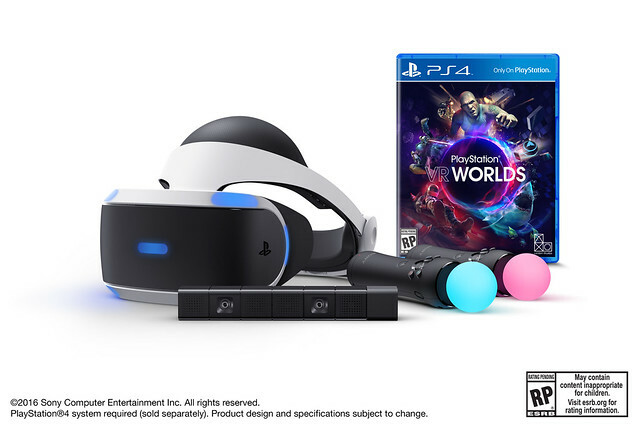 There’s the $499 PSVR launch bundle which is a limited edition, and the normal $399 core bundle that will be available March 29th. PSVR Worlds is a premier launch game that has a little bit of everything with five games in one. The launch bundle will also be available in Canada for $699.99 CAD. Regarding the total amount of PlayStation VR units in stock, it will vary with each retailer but there are shipment waves planned. Most if not all retailers are doing it on a one per customer bases. The next batch of pre-orders will happen this summer. The faster you can get your preorder done, the less hassle there is getting PlayStation VR during the holidays.